The 8:00 am service follows a less traditional format, blending contemporary music and words. This service is less formal and has a more casual flow. Communion is celebrated on the 1st and 3rd Sundays of each month. Beginning on the Sunday of Memorial Day weekend (last Sunday of May), and continuing through the end of September, this service is held outdoors in the Church's Pavilion. It is a delightful setting on those early Sunday mornings – there is almost always a breeze! Throughout the rest of the year (October through the Sunday before Memorial Day weekend) the service is held in the Church Sanctuary using the same non-traditional format. The 10:30 am service is the traditional worship hour at which the liturgical orders are used as the format and the church's traditional hymns are sung. This service is always held in the Church Sanctuary. Communion is celebrated on the 1st and 3rd Sundays of each month. During the winter months of January and February there will only be one combined Sunday service at 9:30 am with a varying format. 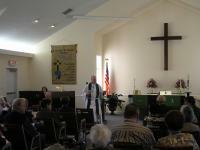 Months with a 5th Sunday or days with congregational meetings are typically 9:30 combined services. Occasionally throughout the year a single combined Sunday service at 9:30 am will be held in lieu of the 8:00 am and 10:30 am services. Click on the Calendar to see if a combined service is scheduled. Sunday School (Adult Bible Study) is held in the Sanctuary at 9:15 am between the 8:00 am and 10:30 am Services. Sunday School is not held on those Sundays where there is only a single combined service. Click on the Calendar to see if Adult Bible Study is scheduled. Special Festival Services such as Christmas, Holy Week, Epiphany, and other occasions are also held. On the First Sunday in October Lakeside Lutheran conducts a special Blessing of the Animals. This fun event gives us a chance to recognize the special place that our pets hold in our lives as we ask for God's Blessing. "And God saw everything he had made, and, behold, it was very good." Genesis 1:31. Choir, Handbells, and Musicians – The praise choir leads the music at the 8:00 am service with the full choir singing at the 10:30 am service. The Joyful Ringers handbell choir play as announced, as do guest instrumentalists. The two choirs and the and handbell choirs rehearse each week on Monday evenings. Guest singers, ringers, instrumental soloists, and duets are invited. Please contact our music director if you are interested in contributing musically to our worship services. Assisting Ministers and Communion Assistants – Assistants lead parts of the liturgy and help distribute the communion elements. Lectors – Lectors read the scripture lessons at worship services. Ushers – Ushers assist in welcoming worshipers and carrying out the logistics of the worship services. Altar Guild – The Altar Guild prepares the altar for worship and maintains the altar linens, banners and communication supplies. Altar Guild members are typically divided into teams with each team rotating responsibility for the altar for one month at a time. Greeters – Often done by couples, greeters welcome everyone on arrival, with particular attention to visitors by inviting them to sign the visitor book with contact info and providing Evangelism’s goodie/info bags.